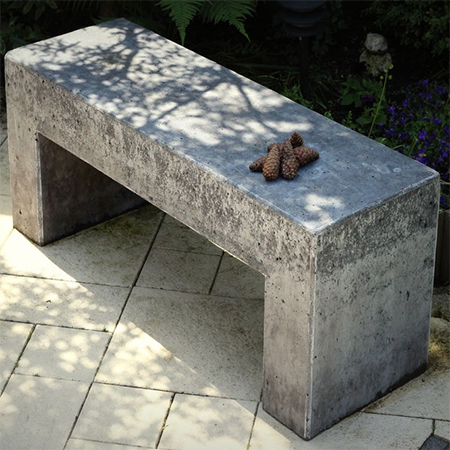 Concrete is an inexpensive way to make a variety of projects, but it’s also the ideal material to use for making a garden bench that not only offers a comfortable place to sit and relax, but also becomes a feature in a garden. Use powder pigments to tint to a variety of colours, or apply concrete stain for subtle hues. *I used 10 pre-mixed concrete bags (25kg each). The pre-mixed bags are easy to use. 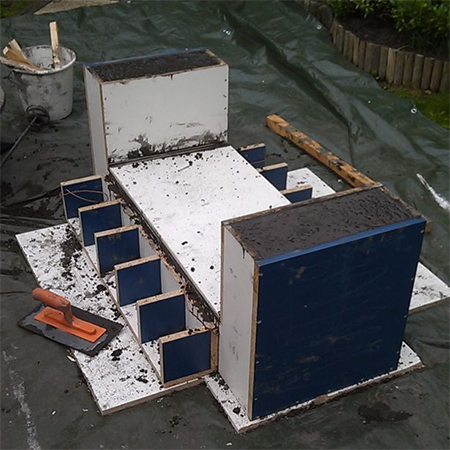 When you want to make your own concrete you have to put the cement, sand and gravel together. 1 part cement, 2 parts sand and 3 parts gravel. 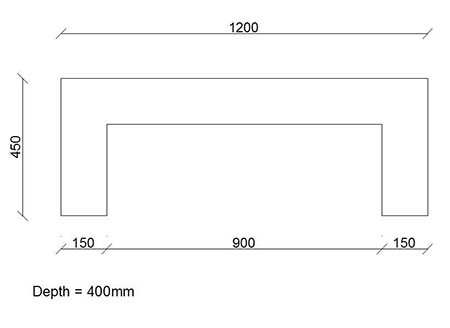 When you change the size of the bench you have to calculate the amount of concrete you need. A 25kg bag of concrete is good for 12 liters. 1. 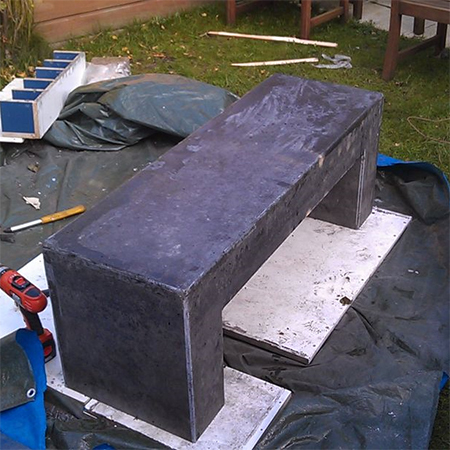 When casting concrete into any shape you need a form. The form is what gives the finished project its shape. To make a form you can use shutterply or a cheap laminated chipboard. The latter is easier to work with and allows the form to be easily removed once the concrete has cured. Note: See Step 5 below for additional framing that was added later on. This strengthens the top sides and prevents bowing when you pour the concrete into the form. Also note that you need to cut a piece of board to cover the underside of the top once the concrete is poured into the form. 2. 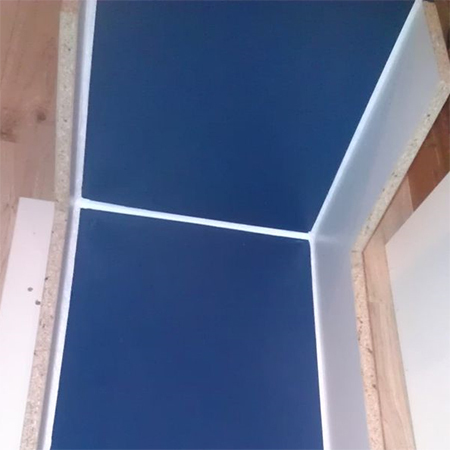 Apply Pattex universal silicone sealer to all the joins on the inside of the form. Use a Pattex Profiler Kit or your finger to smooth the silicone. 3. 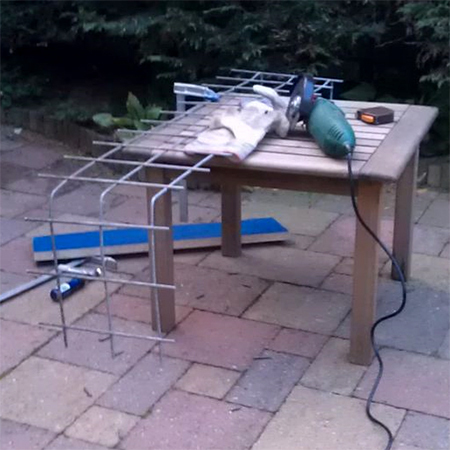 Steel mesh was cut down to size using an angle grinder and then bent to shape. You can also use steel rebar to reinforce the concrete and you will find this at your local Builders Warehouse. You need to place steel mesh or rebar with an offset of at least 4 cm from the concrete surface. The mesh or rebar offers tensile strength. While this bench is 15cm thick it might not be really necessary, but it’s better to be safe then sorry. 4. 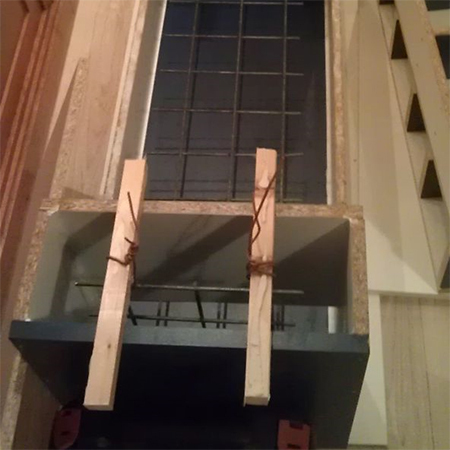 To ensure that the steel mesh or rebar is positioned within the form use scrap wood and rope or nylon cord to lift and hole the steel at the correct distance. 5. 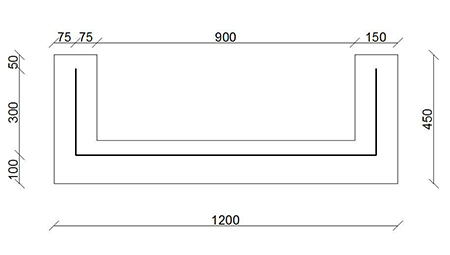 Before filling the form make sure it is on a flat, level surface. Mix the cement, slowly adding water until the mixture is slightly stiff and not too sloppy. It should fill the form without any air gaps and settle flat once poured in. During the mixing is the best time to add any pigment powders to colour the concrete. Wear gloves when working with cement. 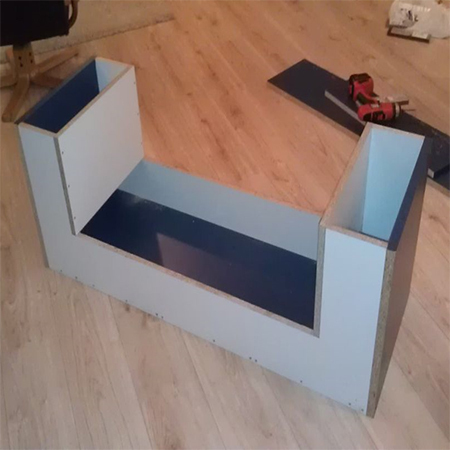 ABOVE: Here is the filled form and you can see the additional support added to the sides of the top, as well as the board screwed in place to close off the underside of the top. As you add cement mix, tap the frame all the way around to remove any trapped air bubbles. Start at the bottom of the form and work your way around and up. Repeat this as you add more mix. Wait 7 days before removing the form and then invite a few friends around to help you move this 25kg monster to its final resting place!